A harrowed looking man (Steven Ritch) wanders into a bar. He has a drink, stumbles around a bit and leaves. One the patrons follows him out to mug him for his remaining cash. There’s a struggle and the would-be mugged ends up with his throat torn out. The deputy looks for the man but only finds the paw prints of a wolf in the snow. Later, the man awakens and can’t remember who he is. He pleads with a local doctor for help. A couple of scientists arrive claiming they are missing a former patient, and would be glad to help the police in their manhunt. The scientists, however, have other plans. The Werewolf is unique because the source of lycanthropy is not some ancient curse, but radiation. This makes a lot of sense for a film from 1956, the supernatural was out and atomic fear was in. The Werewolf wastes no time in getting down to business, we know who and what the protagonist is within minutes. 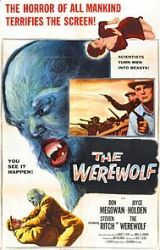 A lot of werewolf movies are centered on a mystery: “Who is the werewolf?” This time the question is: “Why is this person a werewolf?” I found that to be a refreshing change. The werewolf is of the snarling leaping wolf-man variety. The make-up is well realized, if not overwhelmingly original. The whole film is shot with a noir edge, scenes are filled with lots of dark shadows creating a claustrophobic effect. This stands in contrast to the wide open vistas of the outdoor scenes. The Werewolf is a great little horror film, well-made and filled interesting little twists on an established genre.